With Subscription Manager you can create subscription forms, maintain subscription messages, send confirmation message automatically, configure the subscription forms, load subscribers list, View reports, integrate with Email Marketing Software to manage contact list and campaign management. 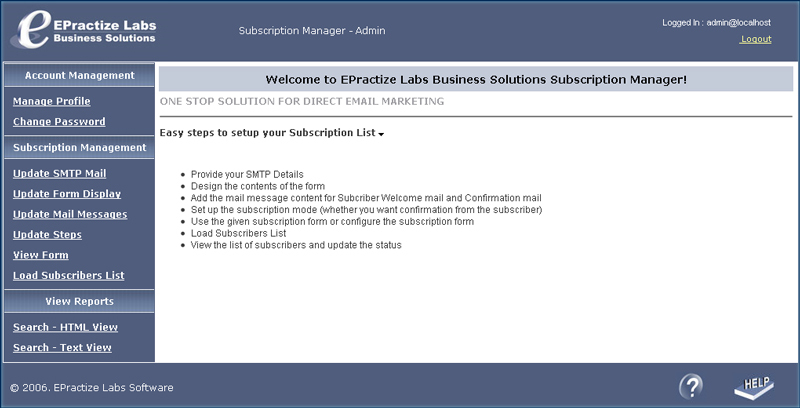 Manage Subscription Form - Configure the Subscription form with your own header and footer messages. Manage Communication - You can configure the subscription mail messages for Confirmation message, Subscription message and mail subjects respectively. You can also configure the email subject for unsubscription. Customize Subscription process - If you want the user to confirm the subscription, you can configure the subscription steps accordingly. Download Subscription code - You have different options to use Subscription form. * Directly use the URL for subscription * Directly use the popup URL or Subscribe button for subscription * Copy and Paste the HTML content into the page where you want to display the subscription form. * You can also configure the required fields for subscription. For (eg) if you do not want the Name and Country details, you can comment those code. * You can change the look and feel of the Subscription form using this option. Load Subscribers - You can load all your existing contact list of email ids to the Online Subscription Manager.